There are many creative ways to support the San Diego REP, both now and for the future. Such future gifts are called "planned gifts," because with thoughtful planning, you create win-win solutions for you and San Diego REP.
YOU CAN donate your house, continue to live there, and get a tax break at the same time. Be part of the legacy that ensures the future of our great artistic work. The REP Legacy Circle honors members that designate The REP as a beneficiary in will, trust, retirement plan, annuity or insurance policy. REP Legacy Circle members receive recognition in all San Diego REP production programs and invitations to all exclusive donor events. Have you made a planned gift to us but don’t see your name listed? 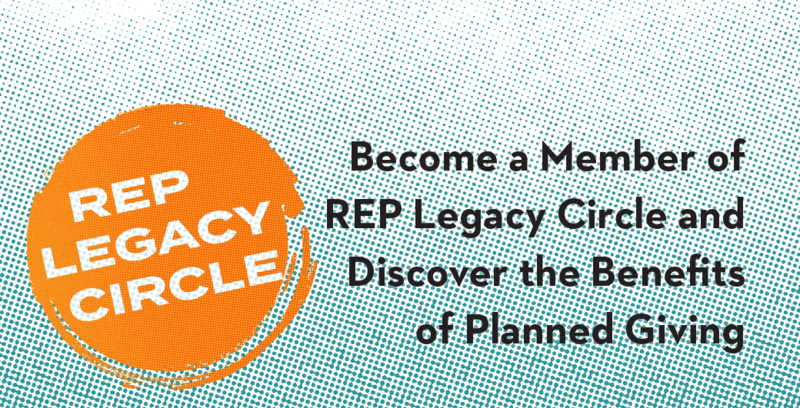 To be inducted into The REP Legacy Circle or for more information, please contact Director of Development, Beth Savage at 619-231-3586 x619 or bsavage@sdrep.org. Our Endowment was established at San Diego Foundation with the requirement that the principal remains untouched. The funds are invested and the interest earned is used to support San Diego Repertory Theatre in perpetuity. To learn how to include The REP in your estate plans, please contact Director of Development, Beth Savage at 619-231-3586 x619 or bsavage@sdrep.org.